While the Google News team has been hard at work redesigning our service for smartphones, we’ve also been thinking about our milllions of users around the world who access the web not from a smartphone, but from a feature phone, using Opera Mini as their browser. 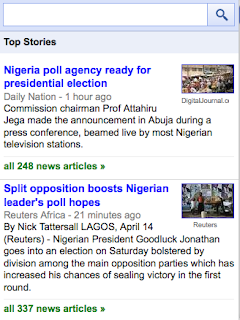 So we have rolled out a redesigned Google News for Opera Mini in all 29 languages and 70 editions of Google News. This includes an enhanced homepage featuring richer snippets, thumbnail images, links to videos and section content without explicit navigation, a convenient search bar, comfortably spaced links and the ability to access your desktop personalization on your phone. We hope that this will improve the news browsing experience for Opera Mini users around the world, including millions of people using a feature phone as the primary point of access for the web. See it here in the Indian Hindi and Nigerian English versions. So, pick up your feature phone and point your Opera Mini browser to http://news.google.com to catch up on news anytime and anywhere. For more information or to share your feedback with us, please visit our Help Center. seriously.. what other company bothers to optimize their products for competing browsers. Thumbs Up Google. can google detect my mobile device even i'm using Opera Mini browser? Good job Google! :) Now take care of your other services to work with Opera (Mini, Mobile and desktop too) as it should. reat stuff! Way to go Google! However I'd like to echo the comments made about supporting Opera Mobile too. Great job Google, Opera Mini deserves that. Finally some Opera support from Google! Please do the same for the rest of the Google and Opera products. Thank you! I've been using the iphone version, which worked very well with opera mini, but this makes it easier! Thank you! Thanks for that! And now please optimize your desktop services (such as Picasaweb, Gmail, search !! !, etc.) for Opera as well.. Opera doesn't have so many users, but it is a good browser! Thanks! BTW... I am still waiting for Google to optimize Gmail and other services for the desktop opera. But why doesn't google support Opera Desktop so much for anything? Thanks so much for the gift! ... -And by the way Google; Opera Mini is not only for feature phones, it is used by millions of millions of smartphone and tablet users around the globe. and is running on TV, nintendo...... thousands of devices.. Many thanks! Google News is the type of service I'm more likely to use when away from a desk, so better mobile support is great. opera mini, but this makes it easier! Thanks, it's one of the best from Google to us Opera Mini users! Thanks a lot Google for this step. A user of the Desktop, Mobile and Mini version of Opera. By the way, for anyone having trouble with G reader, try the iphone version at www.googlereader.com/i/ (?). Now if reader become better compatible, this would be even more wonderful!! FYI: Using google.com/reader/i/ with Opera Mini is neither convenient nor practical because click after reading an article causes page reload on server, and list loads with all articles closed (including that one which was read), so click hits unpredictable location. This is even more dangerous because accidentally several articles may be marked read without being read. You're wasting your time. 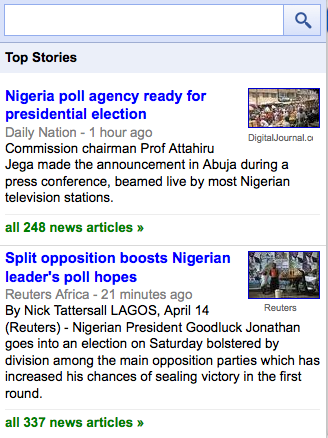 Since opera mini can render the desktop version of G.news, why should one switch to the poor content mobile version? At least one thing is commendable: you didn't make mobile redirection mandatory. Sounds good. Now do same to Reader! It's not usable currently. Gmail, which many have asked, works fine with separate java app. WOW. 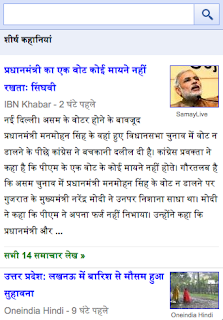 Google NEWS fits very well on Opera Mini 6! 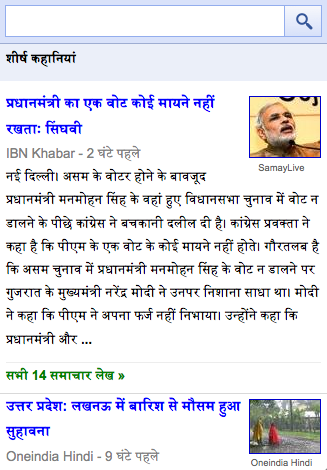 Who could have though READING NEWS ON MOBILE VIA OPERA MINI COULD BE FUN!? THUMBS UP FOR BOTH G and O!! G and O !! GO !! a lot of congratulations google, Its a Great news, Great job for world people. I always googles love.thanks google. Yeah that's it! We (opera fans) deserve it. Now somebody saw the (ghost of) opera. Thanks google. Welcome to the Opera! Opera Mini Browser its the best browser for any device, and easy to install the software.